Pretty sure this is a repressing - from 2000. This is when I picked it up anyway, sealed, in Beggars Banquet, in a Metroplex company sleeve. The track I play is a slight re-edit with a spin-back style effect on the break. What's the game is dark and deadly experimental techno tablas running underneath...Essential! This is acid and not! 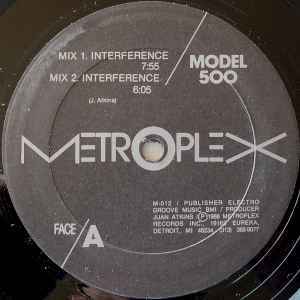 Interference is one fo these forgotten tunes that never ends to impress. Proberly influed of acid Mr Atkins produced this record -88. Interference have a groovy and wicked bassline which certainly is one of a kind! Ages before software-programming. However Eletronic don´t reach the same standard. But O.K. Corral is a uptempo classic technotrack.